Though not all-inclusive, the list reflects a representative mix of affiliate origination, key station origination and independent syndicator programming. Independent Radio programming syndicators launched several of the more successful suspense-thriller and supernatural dramas during the 1940s. The still comparatively young ABC, and its earlier The Haunting Hour, Diary of Fate, The Clock and The Unexpected, had enjoyed reasonable success. Extending its run of supernatural dramas seemed like an equally reasonable gamble for ABC's Fall 1949 Season roll-out. The Croupier, a supernatural drama employing an equally supernatural croupier to 'spin the wheel of Fate' for its protagonists was, by 1949, a familiar device to radio audiences of the era. Another persuasive guarantee of success was Milton Geiger both penning and directing all of The Croupier's scripts. Geiger was at the height of his considerable talents by 1949 and would find even greater success over Television during the 1950s and 1960s of its Golden Age. ABC rolled out its 1949 Fall Season premieres the week of September 18th 1949. Included among its new offerings were Starring Boris Karloff, new seasons of The Adventures of Sherlock Holmes and The Amazing Mr. Malone, and The Croupier, all presented on Wednesday evenings in ABC's Wednesday night 'Mystery Block' lineup. ABC also broadcast a television version of Starring Boris Karloff on Thursday evenings. But as usual, given ABC's penchant for counter-programming, Starring Boris Karloff's radio opposition was the ever-popular Bing Crosby Show or You Bet Your Life, depending on the region; and The Croupier's opposition was either The Bing Crosby Show, Family Theater, or Mr. District Attorney, again depending on the region. Given the stiff competition, it was apparently ABC's calculus that listeners would opt for a block of Mystery programs over the individually popular long-running programs that opposed ABC's individual Wednesday night components. 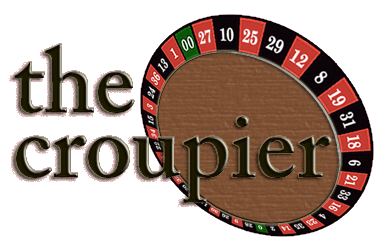 "Gripping stories of Man's eternal conflict with Fate"
"I am The Croupier. I spin The Wheel of Life. You, the players, make your fortune--your future--what you will. It is for you to choose a path: Jealousy, Envy, Hatred, Fear, Happiness, Love, Peace. These are the dark and the bright colors of the soul. So, mesdames et monsieurs, place your bets!" 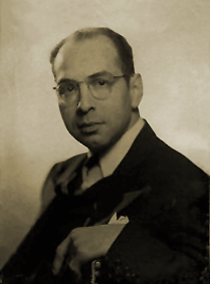 Needless to say, with the above introduction Milton Geiger opened up a world of dramatic possibilities for his directorial and writing talents to exploit over the course of the series. Unfortunately, The Billboard's Jerry Franken was less than fully impressed in his review of the premiere of The Croupier and its presentation of "The Roman," starring Vincent Price. Franken gave the debut effort a "B plus for effort" in his October 1st review. Franken appeared to suggest that given Milton Geiger's already legendary writing talent, the reviewer had every reason to expect something a bit more polished and less contrived than the series' opening salvo. Perhaps it was simply a case of overly optimistic expectations on the reviewer's part. Though in the end, he allowed that, given the series' premise, Geiger had left himself plenty movement toward better dramatic vehicles--and dialogue. Our own experience of auditioning the single circulating exemplar of The Croupier seems to buttress Mr. Franken's observations. The premise was certainly novel, the performances well above adequate to the material, and the resolution reasonably intriguing. But we'd have to agree with Franken's observation regarding Geiger's unnecessarily elaborate reach far exceeding his grasp. Many of the lines did seem overly contrived and prosaic for the underlying plot. But of course, given Gieger's track record, there's every reason to believe that the series improved in later episodes. One of the entertainment industry's most prolific and versatile writers, Geiger could write for any dramatic genre with demonstrated, consummate skill. The Billboard reviewed the ABC premiere of The Croupier in its October 10th 1949 issue. California State University at Northridge: Oviatt Library Special Collections; The Papers of Milton Geiger (1938 - 1973). 8:30 p.m.--The Croupier (WISC): new series by Milton Geiger, starring Vincent Price. 7:30 KECA--This is mystery night on ABC . . . . 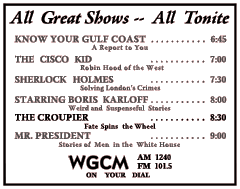 Listen to "The Amazing Mr. Malone" at this time; "The Adventures of Sherlock Holmes" at 8:00 . . . "Boris Karloff" at 8:30, and "The Croupier" at 9:00. GEIGER, Milton, of Northridge, passed away September 29, 1971. Survived by his wife Dorothy Geiger, daughters, Katie Nadler, Bunny Geiger, Carolyn Nadell; brother, Wilson Geiger; grandchildren, Alaina Nadler. Milton Geiger, author of Broadway play "Edwin Booth." While in Smithsonian Institute he wrote many speeches for government and theatrical personalities. Services were held Sunday, October 3, 1971 at Groman Eden, Mission Hills. Interment at Eden Memorial Park.